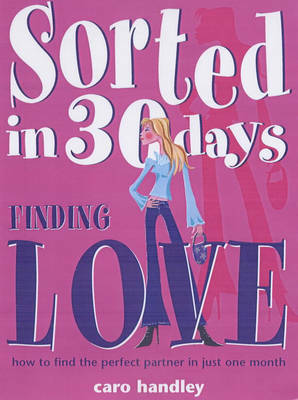 For anyone who wants to sort out their life but doesn't have time to plough through hundreds of pages of self-help tomes, the new Sorted in 30 Days series provides a quick-fix solution to those niggling concerns that prevent life from running as smoothly as it should. Written by life coach and journalist Caro Handley, Sorted in 30 Days is a series that offers practical advice on the key issues which are dominant in all of our lives. Each book is based on a 30-day plan, with a double page spread for every day. The books will show the reader how to identify whatever isn't working in this area of their lives and how to implement the changes necessary to make a positive difference within a short space of time. They will be encouraged to believe in themselves and their ability to make changes that will increase their happiness, and, through setting themselves attainable goals, to view the challenge of achieving them as exciting and energizing. The books will be fun, clear and user-friendly, with tools, exercises and challenges leading the reader down a clearly defined path towards the outcome they want. The theme will be moving forward, taking action and succeeding, no matter what has gone on in the past or what their starting point is. Each book will be based on a promise that if the readers do what is asked of them, they will have made major differences in their lives by the time they finish the book. The Sorted in 30 Days series is guaranteed to help you realize your full potential and get your life back on track within the short space of a single month! Finding Love; This book is aimed at people who want to find a long-term, loving, satisfying, exciting and successful relationship. Whether you've had a series of unsatisfying short-term relationships, have come out of a longer-term relationship, or simply never got going in relationships at all, it guides and encourages you through the steps needed to find a lasting, healthy relationship. It addresses the key issues of what you want in a relationship, what you are prepared to bring to a relationship, what's stopped you from having the kind of relationship you want, how to meet and identify the kind of person you're looking for and how to begin a relationship in a totally different way. Within 30 days you'll feel great about yourself, you'll be having fun dating and you'll know that the relationship you want is on its way, how to recognize it and how to manage it when it comes.